On December 16, 2016 the Mississippi Gaming Commission voted to approve Casino Over Under® as a licensed game and is now available for play in all Mississippi casinos. Only a few days later, Casino Over Under® then filed for a second license in Pennsylvania. On December 16, 2016, Casino Over Under® was officially licensed by the Mississippi Gaming Commission. The game was then officially added to the list of games licensed for play in Mississippi casinos. This concluded a 7 month investigation into the individuals that created the game as well as a field trial of the game itself to make sure there were not issues with the pay or surveillance. Now that the game is licensed, Casino Over Under LLC is seeking placements throughout the state of Mississippi. At the moment the game is being offered at Magnolia Bluffs Casino, Natchez, Ms.
Just a few days after getting approved in Mississippi, a second application was filed for the game in Pennsylvania. Similar to what Mississippi Gaming Commission did, the Pennsylvania Gaming Control Board will now conduct an investigation to see if the game meets the Pa standards. As part of that application, the game was sponsored by Mount Airy Casino, Mt Pocono, Pa. Mount Airy officially filed a letter of intent to offer the game once it is approved by the Pennsylvania Gaming Control Board. Unlike most new games, COU is not a variant of BJ or Poker nor is it a side wager. 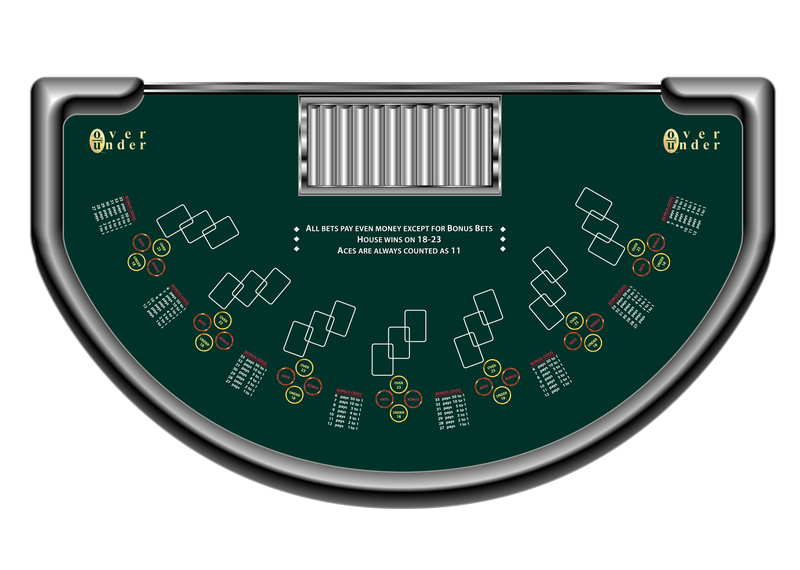 It is a stand-alone, original, casino table game that is easy to play and has a fast pace. The concept is based on the O/U utilized in sports wagering. To play, a player places an ante to get one card face up. After seeing the card the player then must determine if their three card total will be over 23 or under 18. Aces are always worth 11. In addition to being offered at casinos, the game is also available in the appstore as one of the store's freemium apps. The game has a rating of 4.8 out of 5 stars and has been played in over 50 countries worldwide.